The painting and coating industry is an excellent choice for those that enjoy working with their hands. Painting and coating requires a detail-oriented and patient demeanor, but it can be very rewarding for those that are interested in a very unique and diverse trade. According to the Bureau of Labor Statistics, a painting and coating worker has a median income of $31,170 per year, or $14.99 per hour. Painting and coating workers usually require no form of higher education, and many companies will hire a worker with only a high school diploma or GED. The painting and coating industry is growing about 9% a year, and there are currently an estimated 155,200 painting and coating jobs throughout the nation. Those that learn the painting and coating trade can often move into other, similar industries for advancement. What Does a Painting & Coating Worker Do? A painting and coating worker will create long-lasting, professional paint finishes. These paint finishes can be for a variety of purposes. 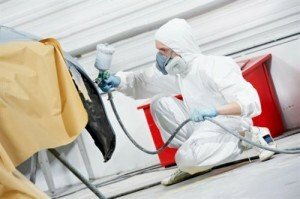 Automotive painters are the most common type of painting and coating worker, but there are also painting and coating workers that work with jewelry, furniture and other items. A painting and coating worker can even be someone who creates confections, as some types of candy are considered to be painted with candy coatings and chocolate. Painting and coating workers need to be very skilled. They first need to prep the surface of the material to be painted so that the paint will adequately adhere. This could include sanding the surface or priming the surface. Sometimes the paint will be sprayed onto the surface, and other times the item will simply be dipped in the paint to fully coat it. The painting and coating worker will need to be skilled in these various methods of painting. Vehicle painting has a tendency to be more complex than other types of painting due to the fact that it needs to be so durable and strong. How Do You Become a Painting & Coating Worker? The process of becoming a painting and coating worker usually varies depending on the type of painting that is being done. Furniture and component painters will usually only require about a month or two of on the job training. There is no apprenticeship program or official type of training program. Instead, the painting and coating worker will simply need to be hired on to a company that performs this type of work and they will be able to begin to learn the trade. Those that are interested in automotive painting and coating will have a longer training process. Many of these workers will need to be trained for upwards of one to two years in every step of the process. Many automotive repair companies will need to train their painting and coating workers to match paint colors. These automotive workers may wish to enter into a school training program at a technical school. Some companies will sponsor this training for the right applicants. How Do You Advance as a Painting & Coating Worker? Painting and coating workers that are not in the automotive industry may wish to consider becoming an automotive worker, as these workers usually get higher pay and better benefits. Automotive painting and coating workers can consider procuring their certification from the National Institute for Automotive Service Excellence to obtain better positions within the industry. Painting and coating workers can also consider diversifying into other related trades such as welding and cutting, which has a very bright industry outlook overall. Painting and coating workers that get involved in the automotive field can eventually become a supervisor within their industry or consider opening up their own automotive shop and becoming self-employed.